Have you ever heard a mix that had elements so wide they sounded as if they were originating from beyond the speakers? Often, this is the result of a stereo width enhancer processing the audio in a way that tricks our brain into thinking the speakers are farther apart than they really are. This week, in the second installment of "Mixing with AIR," I will break down the new AIR Stereo Width plug-in and share with you some of the tricks and pitfalls of stereo enhancement processing while mixing. Whether it be a basic stereo width enhancer in a portable boombox or a complex "virtual surround" system using the latest in psychoacoustic research, stereo field processing has a been a trick of sound engineers and hifi designers long before the era of plug-ins and the DAW. Because our ears (and brain) have the ability to localize sound based on incoming time and frequency information, we humans can effectively localize sound with a fair degree of accuracy. For example, if a friend of mine calls out to me from my far right hand side, my brain will pick up on the location and relative distance of the sound based on the time it takes to reach each ear and the frequency make up of the signal. You see, the waveform of my friend's voice would hit my right ear first and the left ear just a hair later. In addition to the delay, the masking effect of my head would create some high frequency loss in the left ear's signal, helping me further determine location of the sound. Even the shape of our ear plays a critical part in helping us localize sounds around us. By using these same psychoacoustic principles in audio processors, we can create wide, three-dimensional spaces from just two speakers or headphones. An old trick used by engineers for decades to widen a soundfield is to take and delay the left or right side of the signal by a few milliseconds from the other. Take a stereo source track and insert the Multichannel > Delay > Slap Delay II (stereo). Set the left channel to delay 10ms and the right side by 0ms, with a mix of 100% on both sides (see image). Notice how the stereo width of the track instantly increases, use the bypass to compare the processed and un-processed signal. Try increasing or decreasing the delay of one side, notice how delays beyond 30ms start sounding like discrete "slaps" of the right and left hand side, rather than a subtle widening of the signal. Try this trick again on a mono track. Insert the Delay > Slap Delay II (mono/stereo). With the mix on both sides at 100% set the left side to delay 10ms and the right side to delay 0ms. Now listen while toggling the plug-in's bypass. Do you notice that the image of the sound shifts to the right when the plug-in is active, as if the mono sound is now originating predominantly from the right hand speaker? Try switching the delay from the left side to the right (that is 0ms on the left and 10ms on the right), notice anything different? What you are hearing is known as the "Haas effect," or Precedence Effect. By changing the relative time that a signal originating from two separate sources reaches the listener, the sound will be perceived as originating from the initial (un-delayed) source. In my example this was the right speaker. These same principles are also used in live sound systems, when additional loudspeakers are placed far off from the main stage. In order for the audience to perceive the sound as coming from the stage, additional speakers may be delayed to match or exceed the delay of the speakers on stage, so that the sound emanating from these speakers reaches the listener at or slightly later than sound of the mains. Take any stereo audio track in Pro Tools, right-click on the track's nameplate and choose "split into mono." This will create two additional tracks, one for the left channel of the original stereo track, and one for the right (denoted by ".L" and ".R" in the track name). Now take the first new track (the left channel) and pan it hard right. Take the second new track (the right chanel) and pan it hard left. Now group the two tracks together by choosing Track > Group. This will help in controlling the volume of the two inverted tracks and thus the "width" of the effect. Now select all the regions on the two new tracks, choose Audiosuite > Other > Invert and hit process. You should now have a phase inverse left and right channel in addition to your original stereo track. Pull the volume of the two new tracks all the way down, because they are in an active group you should only have to move one fader. Now slowly bring up the volume of the phase inverse tracks and listen. Notice a subtle widening of the original stereo track. Be careful, too much of this will create a hole in the center of your mix but for the most part the trick is mono compatible as the phase inversed tracks should cancel each other out. Pretty cool trick huh? 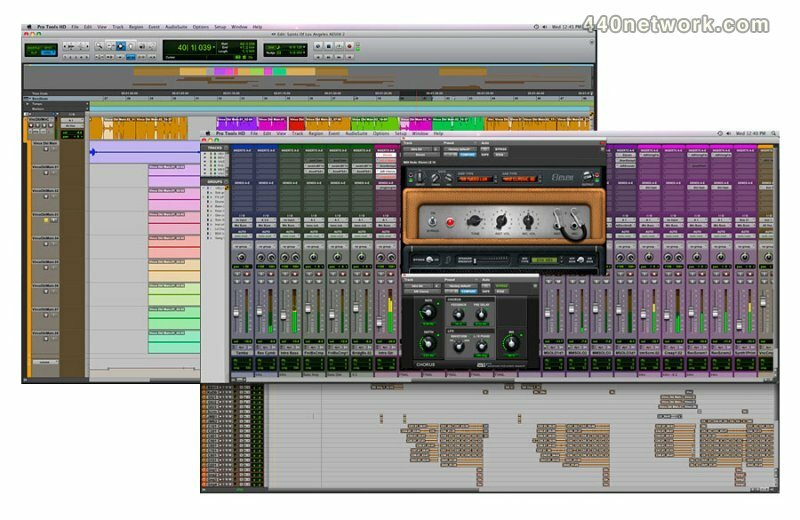 What you just did uses the same principles as M/S recording and plays a major part in many commercial stereo wideners, including Digidesign AIR Stereo Width plug-in. The AIR Stereo width plug-in actually makes use of both of the principles we touched on early in this article, using delay and phase relationships between the left and right channels to create a perceived increase in stereo width. First things first though, the AIR Stereo Width plug-in is not the world's greatest "stereo maker." Despite the manual's claim of creating a "wider stereo presence for mono audio signals," the plug-in itself doesn't even ship with a mono/stereo instance, making the processor near useless on a direct mono signal without first converting the signal into a stereo one. Personally, I found the stereo width plug-in most effective in widening already stereo source material, but I tend to use these types of processors subtly anyways. If you want to use this plug-in effectively on a mono source, your best bet is to bus it into a stereo aux track and place the plug-in on the aux. To do this, simply set the output of your mono track to a free stereo bus (say bus 1-2), create a new stereo aux track and set its input to the same bus (see image) and place the Multichannel > Stereo Width plug-in on the stereo aux track. The stereo width plug-in seems simple enough on the surface, but you will want to pay attention to the processor's Mode selector, as this completely changes the parameters in the "process section. Adjust mode: Much like the phase trick I showed you earlier, this mode is specifically used for adjusting the stereo width of an existing stereo signal. Using M/S encoding techniques the "S" or side level is controlled by "width," while the low/mid/high are used to equalize the side level's signal. Width percentages above 100% would create a wider image while width settings below 100% would create a narrower, more mono one. Additional effect can be achieved with the delay parameter (like my home brew delay example earlier), which delays the right signal relative to the left. Try the preset "Haas guitar doubler" and increase the width. Comb Mode: By M/S encoding the signal and adding delay to M or Middle component, a comb filtering effect is achieved when the two signals are decoded and recombined. This is perceived as some frequencies being played from the right channel and others from the left. As in Adjust mode, width controls the overall level of the S or side channel and thus the amount of comb effect. Because of the comb filtering nature of this mode, the signal's image may become offset to one side or the other. You can use the pan control to compensate for this. In most cases, this effect is a bit more extreme and not something I would do on the entire mix but can be cool on mono sources or as a special effect (hint: try automating this in and out). Phase Mode: Use the low/mid/high controls in the process section to set the center frequencies of 3 phase shifters, which shift the relative phase of the left and right channels. Again, width is used to control the overall amount of the effect. A bit subtler than comb mode but still not something I would use to gracefully widen an existing stereo signal or entire mix, again can be useful to help "stereo-ize" mono sources or as a special effect. In the trim section you will find a "level" and "pan" control. Level is your typical volume control used to trim the output. After processing (especially in comb or phase mode), stereo widening effects may reduce the perceived volume of a track in the mix, use this control to trim the output back to its original level. The pan control determines the left-to-right position of the perceived center of the stereo signal. For example, if you had widened something but want to place it more in the left side of your mix, use this control to do so. Use the "Adjust" mode on your master bus track to help widen your entire mix, keep the width control low as too much can cause trouble and leave the delay off for this one. I always like to push the width control until I can just hear the widening take effect and then back off a little. Check the mix in mono. Sometimes these processors can damage the mono compatibility of your mix. Use a phasescope or the "mono" button on your DAWs monitoring section (even Mboxes have a mono button) to be sure. Remember, not everything has to be stereo! This is a problem I find in many amateur mixes these days. Because everything now comes in stereo, from virtual instruments, loops, etc, everyone thinks that two channels are better than one. Wrong! If every element in your mix is super-wide stereo, there is no sense of place in the stereo field. Generally the idea is to use pan with mono elements to create a stereo spectrum, and subtly use stereo elements to create a sense of space and place for the listener. I'll often get sessions to mix where every instrument is on a stereo track; many times I split at least half of those tracks into mono and delete one side before I start mixing.